Alexandria Researcher is the online catalog for all of the libraries in the Lapeer Community School libraries. To find a book just click on the image and enter a title, author, or subject. If you want to find a book in a specific library, click on Advanced Search and use the copy location feature to add the name of the school to your search terms. See your librarian for help with your login. 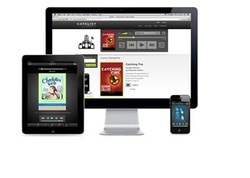 CATALIST DIGITAL gives you access to eBooks. Visit the App Store or the Google play Store and download the Catalist APP. Upgrade immediately. Click on the laptop icon and access the link for your school's digital collection. See your librarian for the login information.